What accounts for Earth Day’s flush of new energy? Here are three reasons among many. Global climate change is providing new evidence of the power of science, policy, and economics to help people recognize an urgent threat and seize on realistic and necessary solutions. Businesses and governments have plenty of irrefutable evidence that the new path to prosperity is closely tied to using natural resources, particularly energy, much more efficiently; pollution, it turns out, is the same thing as throwing away money. And the right wing attack on environmentalism and environmentalists has run its course. When a southern American city is drowned by a hurricane, the tundra is melting in Alaska, and a drought worsens conditions for agriculture on the Colorado Plateau it’s just plain silly, and enormously damaging politically, for the Republican leadership to be so lame on things green. Here’s one more thought. Earth Day’s attractive maturity is tied to how the generation that brought it to life has gotten much more comfortable with its competing values. Earth Day, in effect, also is Boomer Day. It celebrates the essential conflict — the duel between self interest and the public interest — that has made the Baby Boom generation both mystifying and miraculous. Earth Day, and the ideas and practices that it represents, is the Baby Boom’s greatest contribution to our time because it’s truly us. The day reflects Baby Boomer’s conviction that we can have it all if we just tweak and adjust and think much differently about how we integrate manmade and natural systems. Now that it’s completely plain that the more sensitively we treat the earth the better off we’ll be in every aspect of our lives, Baby Boomers have the satisfaction of knowing that they were right. The first Earth Day, Wednesday, April 22, 1970, was a beautiful spring day across the United States. The event’s founder, Wisconsin’s Democratic Senator Gaylord Nelson, and its coordinator, Harvard law student Denis Hayes, envisioned a national day of “teach ins,” similar to those occurring on college campuses to rally support to end the Vietnam War. Senator Nelson, who died in 2005, said his “primary objective in planning Earth Day was to show the politial leadership of the nation that there was broad and deep support for the environmental movement.” Senator Nelson was amazed at how the country responded. Pete Seeger performed at the Washington Monument. Mayor John Lindsay banned cars on Fifth Avenue in New York to make room for demonstrations and events. Public speeches, parades, rallies, marches, sit-ins and teach-ins occurred in thousands of communities. Congress closed and political leaders went home to participate in local gatherings. The first Earth Day prompted legislatures in 42 states to pass resolutions commemorating the date, and 20 million Americans took part in Earth Day activities, the largest national demonstration in American history. Earth Day certainly made its mark on me. I was a Highlands Junior High School eighth grader and had just turned 14 on April 22, 1970. The White Plains public schools in New York were closed to allow students to participate in dozens of activities around the city. I convinced Andy Feinman, the other half of what our kindergarten teacher affectionally referred to as the “gruesome twosome,” to come with me to paint the grimy walls of the White Plains train station and to help drag tires and other old stuff from out of the bushes and the nearby Bronx River. Joe Lelyveld, who would later become the paper’s executive editor, reported on our work in a front page article the next day in the New York Times. “Students from Highlands Junior High School painted the city’s ramshackle train station and landscaped its grounds,” he wrote. Though we didn’t know it then, Earth Day came to represent my generation’s best and worst traits. I wanted to make my life matter, to engage in good work that helped people and made a difference. That’s the focus on the public interest that made Baby Boomers tolerable. But I also wanted something back: recognition, money, satisfaction, notoriety. That’s the focus on self involvement that drives our parents and children bananas. It turns out that we’re really an investment oriented bunch. We like to put energy into saving the world. But we also look for a personal return. Earth Day, and environmentalism, is the perfect synthesis of those competing values. As a public school student I was interested in protecting forests in New England in large part because I liked to hike in New Hampshire’s White Mountains and Maine’s Mahoosics. As a young freelance writer in the Deep South in the early 1980s, I reported on and ended the use of a Dow defoliant that was damaging the western North Carolina woods and the people who lived there. I also discovered an insatiable market in the mainstream media for investigative environmental stories that I rode into the Washington bureau of the New York Times. I got the job by nailing an interview with Bill Kovach and Howell Raines, the bureau chief and deputy, that occurred on Earth Day in 1985. Ten years later,on April 22, 1995, Earth Day’s 25th anniversary, I left the Times as a full-time correspondent to found the Michigan Land Use Institute, a statewide non-profit environmental research, advocacy, and communications organization that is now one of the largest state-based green groups in the country. 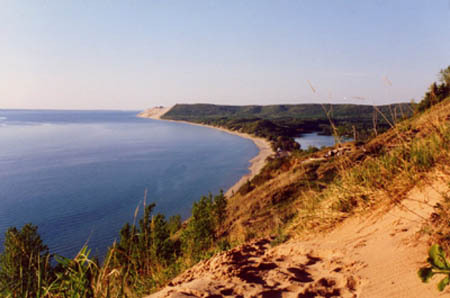 Yesterday while running in the Platte Plains section of Sleeping Bear Dunes National Lakeshore (see pix), this idea of Earth Day’s real meaning to the Baby Boom generation — weighing the public interest and self-interest — came to me. 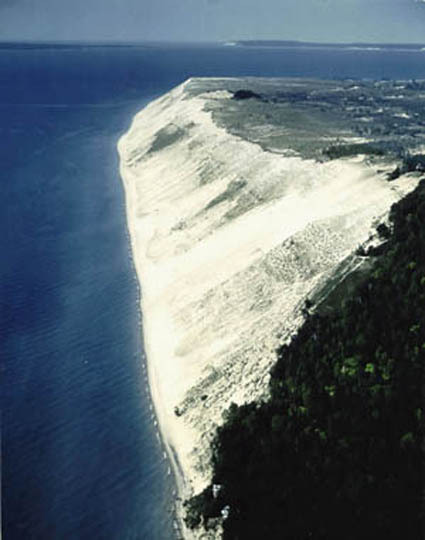 The 71,000-acre national lakeshore, which was established six months after Earth Day, is where our region’s green forests, blue skies, and sable sand beaches meet Lake Michigan’s clear water. A decade ago, when the Michigan Land Use Institute was brand new, we helped protect Sleeping Bear’s boundary from an ill-advised idea to swap private land for public land for a new golf course within the park’s boundaries. We made the case that allowing such a swap in one national park would compromise the legal principle — the authority of government to take private land for public purposes for perpetuity — that had established every national park since Yellowstone. My glorious run, alone with the trees and the spring peepers, on trails that dipped and rose over Sleeping Bear’s dunes and swales, was made possible in part because I’d played some small role in ensuring that the park’s boundaries were not compromised. Every decade or so I celebrate Earth Day by doing something big. This week I bought a brand new Mercury Mariner hybrid, which gets 30 miles per gallon. I drove it out to Sleeping Bear, about 10 miles away, comfortable in the knowledge that I was reducing emissions of global climate change gases, national security threats caused by dependence on foreign oil, and my own fuel bills. The car’s purchase, moreover, is made possible by the salary my environmental organization pays me, along with the fees my environmental freelance reporting generates. Summed up, my new green car serves several noble public interest goals, and a couple of satisfying self-interest needs, too. And there you have it, the essence of Earth Day as Boomer Day. Good piece, and while I’m still skeptic on current generation of hybrids, you made the right sort of choice – SUV/Crossover vs Prius, although I think there is a good package in the Saturn SUV “Greenline” hybrid. My rant is much the same as Bob Lutz’s – Prius is brilliant marketing, it allows Toyota to sell Giant Pick Ups with no backlash. Suspect we’ll keep our current Envoy and my more than decade old car … no fresh environmental cost in steel, rubber, plastics, etc. Dinner tonight with old friend who is with GM Advanced Engineering working on Hydrogen project (leapfrog Hybrids) … hope to learn a lot. I feel good about the Mariner. I;ve wanted a hyrid and I wanted an American car for lots of reasons, not the least loyalty to the US of A. Misplaced perhaps but it felt good buying energy efficiency in an American line, and getting what for now is cutting edge technology. You wonder why, given how hard it was to find this vehicle — it came from a Mount Pleasant dealer through a Traverse City dealership. I also really liked the people I dealt with at Grand Traverse Auto. They worked the numbers to make the purchasae possible and they were all just really personable pros. If you ever want to buy a Ford product in this region they are the place to go. Thanks for writing. That’s funny, I just realized yesterday (reading a book about political parties in 19 century Britain) that I could actually get paid for political organizing if I was willing to do the work required, and really, how would we have political parties, or any other large organization, if we didn’t pay some people to master the tasks? It’s kind of like that Edwards haircut thing- of course I want him to have a good haircut, he’s campaigning for a job representing me.